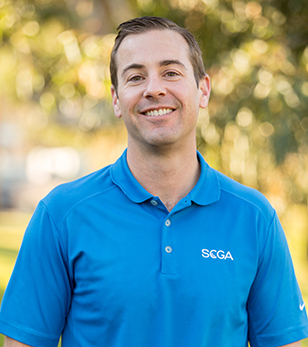 Jeremy took over as Director, Club Services in March of 2013, anxious to reinvigorate the SCGA Club Delegate program, which now includes nearly 600 volunteers. Jeremy will bring new ideas and offerings to regional meetings to better understand how the SCGA can effectively support club's programs along with their retention and growth efforts. He also oversees the popular SCGA Member Outings and Member Advantage programs. He previously worked in both the Handicap & Membership and Rules & Competitions Departments. Growing up in Southern California, Jeremy graduated from San Diego State University. He enjoys being active outdoors and spending time with family and friends. What is your favorite part about working at the SCGA? "I enjoy working with club officials and other SCGA volunteers and making sure they're aware of the various resources available for them at the SCGA. I enjoy working with such great people within the SCGA as well. There is a true 'team' atmosphere here, which is rare to find these days!" What is your favorite Rule of Golf?" "Rule 10 – Order of Play. Not one of the most discussed rules, but with so much information packed within the game, I really value the simple aspect of honor. The order of play is a pretty straightforward rule yet shows your fellow competitors true gamesmanship." Contact Jeremy Pitt at: jpitt@scga.org.